I am about to tackle a custom minifig I always wanted to do. 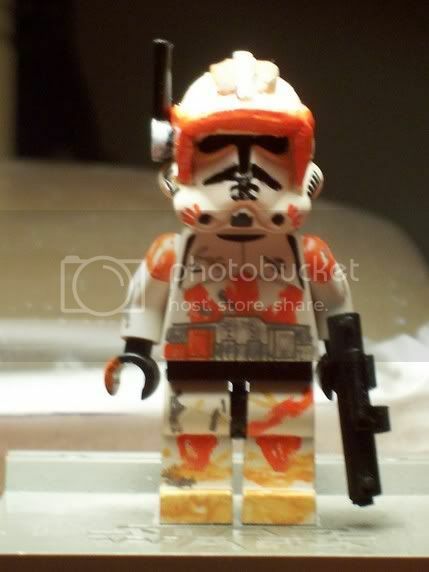 A Custom Cody using the Trans-Orange Visor piece. I searched trying to find some pics of pictures to use as a guide line and had no luck. Does anyone know where I can find some reference pics? Great to see that you'll be takling Commander Cody. I have a ton of Cody Reference pictures on my computer, that I'd be more than happy to email to you. If you are interested send me a PM with your email, so I can hook you up with the reference pictures. I am looking for a pic where someone uses the Trans-Orange visor (from the old ice planet series) for Cody's visor. That was the popular piece to use as a visor not too long ago. I saw several people on this site created Cody that way. I am not finding any pics now though unfortunately. I can't remember any specific MOCs, but a quick search of Brickshelf with the word "cody" yield quite a few possibilities. Including my own. Number five is quite good. Hope this helps. Good luck with getting this to work. As soon as I bought the Republic Gunship (2008 release) I took out the Cody and searched for my translucent orange space visor. However, on trying to fit the visor on the figure, I found out that it does not fit on, the holes in the new helmets are too far back. That irked me, especially since I cracked the visor part way in the front trying to get it to fit. Yeah they visor has to be modified a bit to fit on the new helmets.